- Baby Wipes work just as well for removing eye makeup as those pricey eye makeup remover pads. - Turning on the kitchen sink will stop Jackson's cries EVERY TIME. - Vacuuming stops his cries as well. - It's important to have time alone with your husband, even if it seems impossible with a newborn. 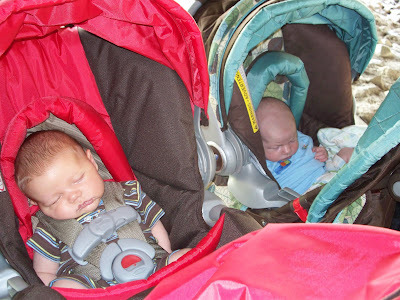 - It's okay to let your baby sleep in his carseat if he'll STAY asleep. - Our friends and family are the best. They have been SO generous and loving since Jackson was born. - It's easier to file baby's fingernails then to cut them. - Baby's get ear wax. 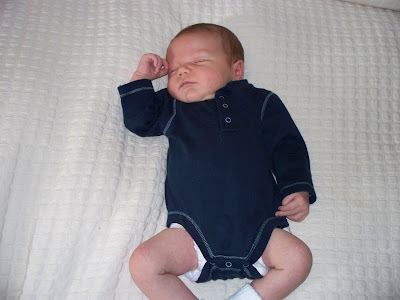 - It's hard to figure out if what I'm eating affects Jackson's tummy, even though I'm keeping a journal of my diet and his eating/sleeping/awake pattern. - Jackson has the Mangold lazy eye - just like me and his Grandpa Mangold. - Pregnancy jacks up your skin. - Twelve weeks is not long enough for maternity leave. My friend Stefanie had her little boy about 20 minutes after we had Jackson. 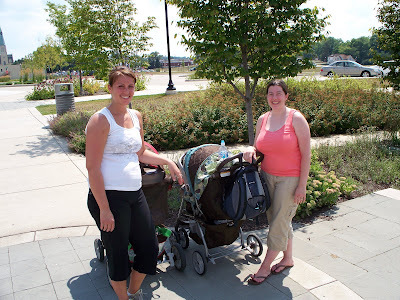 Today we got the boys together and went for a walk with the strollers at the Mishawaka Riverwalk. It was a beautiful day. You can tell from the pictures that the boys were thrilled. :) They both slept the whole time and I think we walked a few miles! Even though they were born minute apart, Jackson looks quite a bit older I think. It must be because Drew now weighs what Jack weighed when he was born! Drew is such a cutie and Stefanie is a great mom. She has great advice and it's awesome to be able to compare notes since our babies are at the same stage. Looking forward to our next walk! Jackson has changed so much within the past week and a half or so. He hardly looks like a newborn anymore. Today we went to the doctor and he weighs 10 lbs. 7 oz! Almost two pounds more than the last time we were in. Here's a video of my little man from the day he turned 4 weeks old. So, Mom, this one is for you. I wanted you to be able to see Jack doing his latest new thing - making noises and having a "conversation" with (okay maybe not a conversation) and smiling at his mama. Love you! Can't wait to see you in September. Last Thursday Jackson had his newborn photos taken. I am thrilled with the way they turned out! I found a photographer in Goshen who does natural light photography and she took wonderful pictures of him. And okay...I know I'm biased because I'm his mom...but seriously the pictures that we had taken last Thursday when Jackson was 4 weeks are adorable! :) Am I allowed to say that as his mom? Who cares..I'm saying it...he's the cutest baby ever. I am typing this one-handed because I'm holding Jackson in my other arm so excuse any typos. 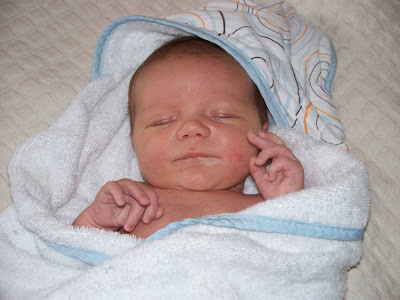 :) Jackson is one month old today ... I cannot believe it. He has really grown/changed this past week. His little cheecks are filling out and he's looking less and less like a newborn (sniff). Though its a lot of work, I wish he'd stay this size forever. Its crazy how much I love him. Let me tell you about his latest cute thing... Before he starts fussing, he kicks one leg over and over like ke's kick-starting a motorcycle! Maybe he's a future Harley man. :) Its adorable asnd a great sign that he needs mom! Jackson loved the fair, but im not so sure he loved the food. Im pretty sure 8 poopy diapers in one evening is niot good for his little stomach. Guess Ill be staying away from the elephant ears from now on. As a result I've decided to start a journal to keep track of what /i eat to see if anything upsets his stomach, as well as hus eating and sleeping times (in hopes of putting him on a schedule at some point). More pictures coming soon! This weekend: painting the basement and Jessica's bridal shower! Here are a few pics from today's "photo shoot". Jack is three weeks old today! 5:30-7 or 7:30~ Wake Up and Do It All Over Again! Throughout the day we also have many diaper changes, many cute little facial expressions from Jackson and an occasional belch. 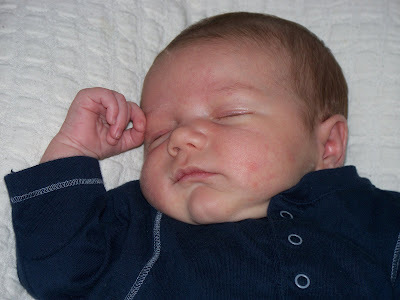 He has been such a great baby thus far - he's a great sleeper which has allowed us to be able to go a few places already. Yesterday we went to Shipshewana and he was an angel! Sunday we'll go to the fair to watch Jake, Josh & Jon show their dairy beef steers!